This is the interesting thing about globalization and spillover of design practices; the airport design, vehicle design, clothes, beverages, electronics, hotels, credit cards, to only mention a few areas. The world has largely standardized the models, processes and systems to deliver on key globalized designs. Is language the last frontier of defining uniqueness in this over standardized world (Europe even has the Euro currency as a standard)? Maybe some of the next items to standardize include; language as English, power plugs and adapters, world level identity system (the passport plays this role currently). This discussion is taking us into platforms; check my post on Platform Operating Models. 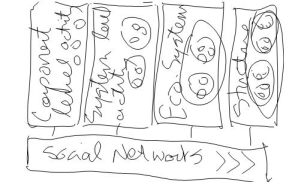 Eco-system level activity is the activity that describes interactions as they occur between social movements (Facebook, Myspace, Bebo, Friendster, Blogger, WordPress). Check this service to subscribe to this blog. Eco-structure level activity occurs when an entire generation is affected by the adoption of the human-tech-social integration and where this socio-adopted attitude now also spills over onto other generations. So, there is a generation that is active in creating content on social networks, where an entirely different generation reads and absorbs the content with (currently) completely unknown results. Politics are affected as much as business by younger people as is expressed by Wired in this article. Where is this taking us if highly opinionated youngsters rule a large portion of the socio-integrated opinion space? Look at this line of reasoning – One of Hegel’s examples is the planets: “all are connected in a system of orbits, but at the same time this connection does not make them what they are; each planet is the planet that it is, all by itself, and its participation in a system with other planets is an additional feature, external to that which makes it what it is.9 Mars would still be Mars, in other words, even if Venus did not exist, and thus the bond between their orbits involves the two in a relationship of necessity and external determination that restricts the independence of both.” The earth relies on the stability of the traits of moon and sun, etc for its sustained existence. What are the stabilization factors in social networks?